When you visit a doctor’s office, elect to have a surgery, or otherwise entrust your health to a health care professional, you expect your care to meet a certain level of excellence. After all, you’re spending potentially thousands of dollars on health care. Of course, doctors cannot promise to heal you and they cannot guarantee an outcome; however, they still are bound to certain professional codes of conduct. If a medical provider breaks a certain code of conduct, it can be referred to as medical malpractice. Generally, medical malpractice occurs if a medical provider (hospital, doctor, nurse, etc.) causes injury to a patient by a negligent act or omission of an act. There might be a misdiagnosis, improper treatment, and/or errors in aftercare. Because patients go into healthcare scenarios with the general expectation that they will receive good care, medical malpractice can sometimes go unnoticed or unprosecuted. If a recent medical procedure or experience left you or a loved one with an injury, though, it’s worth determining whether medical malpractice might have been involved. 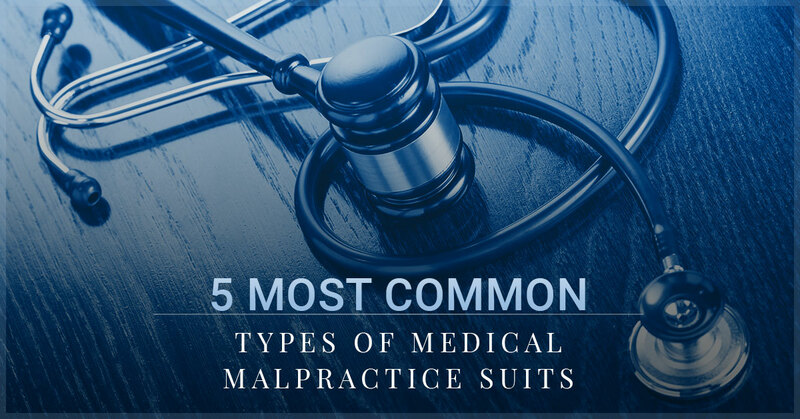 Below are the five most common types of medical malpractice lawsuits. If any of these scenarios sounds familiar, call a medical malpractice attorney as soon as you can. As the name suggests, “misdiagnosis” occurs when a medical provider improperly diagnoses a patient’s symptoms. This doesn’t mean that a doctor will be held liable if they diagnose an illness as a sinus infection and instead it’s a head cold. Rather, misdiagnosis usually comes into play with more serious illnesses, such as heart attack and cancer. Because misdiagnosis here holds such grave consequences, it’s more often a source of medical malpractice suits. When attempting to prove that medical malpractice occurred, the plaintiff must show that a medical professional failed to uphold the standard of care for the situation. In other words, would another doctor with similar training in a similar situation have made a different diagnosis? If so, medical malpractice might be involved. It might seem impossible that a doctor would operate on the wrong patient or body part, but this happens more frequently that you’d think. Surgical errors are usually egregious, such as operating on the left shoulder if it was the right shoulder that needed the repair; performing the wrong surgery on the wrong person; or leaving surgical equipment in the body post-surgery. Medical professionals go through great lengths to avoid surgical error (marking the correct body part; asking the patient numerous times to verify their identity and surgery), but it still happens. If a surgical error has occurred, you have every right to seek damages and reparations for this negligence. A healthcare professional might correctly diagnose an illness or issue, but that doesn’t mean much if they don’t follow through with proper treatment. For instance, if an individual is in the hospital with pneumonia, there is an acceptable standard of care for how long the patient should stay in the hospital. Depending on the patient’s symptoms, recovery progress, age, etc., they should remain in the hospital for a standard duration. If a hospital releases the patient too early (according to the standard of care) and the patient gets more sick or suffers as a result, it could be considered medical malpractice. Failure to treat also refers to lack of explicit follow-up care and instructions, lack of appropriate prescriptions, or lack of additional appointments. Obstetricians and gynecologists face a disproportionate number of medical malpractice claims for childbirth-related issues. Childbirth can come with numerous complications, but there are some scenarios that accepted standard of care says should be preempted. Additionally, medical malpractice during birth can lead to certain conditions such as nerve damage, spinal cord injury, cerebral palsy, and cephalohematoma. If you or a loved one recently gave birth and the mother or child suffered as a result of negligent care, you should contact a medical malpractice attorney immediately. If a doctor incorrectly prescribes a drug (or fails to prescribe a necessary drug), medical malpractice might be at play. Additionally, giving instructions to take the wrong dose of a medication or to administer it incorrectly fall into this category of medical negligence. Finally, if a doctor prescribes two medicines that are known to interact poorly, this represents negligence. This statistic represents the salience of medical malpractice in today’s society. Because patients tend to trust doctors, they also might not assume that a doctor is to blame if a loved one dies or suffers during a medical treatment. However, medical malpractice is rampant in the U.S. If you or a loved one has been involved in any of the above scenarios (or a related one), you should contact an experienced medical malpractice attorney. It’s bad enough having to undergo the pain of medical malpractice — you shouldn’t be left alone to deal with the repercussions. Medical malpractice attorneys understand the nuances of the law and will be an ally for you and your family. To work with medical malpractice attorneys in Albany, contact the law firm of Girvin & Ferlazzo today.